When impressionists painted pictures of people, they made them look like people you would see everyday. Rather than painting religious figures or royalty, impressionists painted people like the local tavern owner, a girl eagerly awaiting the beginning of a play, or workers resting in bales of hay. They often used their own family and friends as subjects in their paintings. 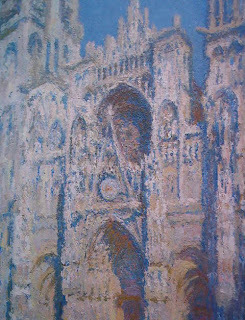 Before the impressionists, painters usually placed the main subject of their painting in the center. It was the first thing the viewer looked at and the background was not nearly as important. Before the impressionists, the main focus was, more often than not, placed in the middle of the painting. Impressionists often put more emphasis on the scene than on the person or main subject of the painting. To do this, they painted the main subject off to the side rather than in the center of the painting. An impressionist painting looks more like a photograph in this way. A photograph captures not only the main subject, but everything around the subject and everything in the photo is important. Photography was just becoming popular in the mid-1800s and influenced the way the impressionists looked at things. The style was called impressionism because the artists were not as exacting about painting a realistic picture. They used many short brush strokes, applying paint thickly, to create the idea, or impression, of a subject. Vincent van Gogh is a good example of this technique. The paint on his canvases is often so thick it looks 3D. 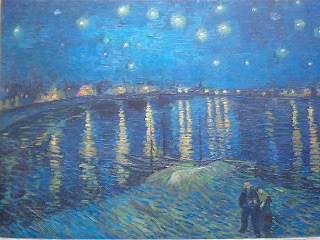 Look at this painting, Starry Night Over the Rhone, and notice the short brush strokes. Also, the painting is so thick that you can see the shadows from the paint. Because of the quick, short strokes, if you stand very close to an impressionist painting and look at it, often the painting won’t look like anything but a bunch of paint blobs. When you back away from it, though, you can see the whole picture. Another characteristic of impressionist painting is the study of light. The way light changed the shadows and colors of subjects was of much interest to impressionists. For example, Claude Monet often painted in series, making many pictures of the same subject at different times throughout the day and in different seasons to see how the lighting affected his paintings. 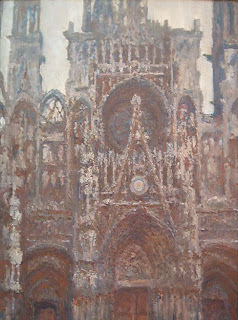 Look at these paintings of the Rouen Cathedral and see how the lighting changed the colors Monet used. This is a great article and it really helped me to undersrtand this art style. Unlike most other articles, this one gave me examples and i felt a deeper understanding of what impressionism is. This really helped me with my art homework, and gave me an excellent impression of what impressionism is really about. Hi. I really loved ur blog as its always gives me new idea for my owm classes which i take. This website really helped me with my art homework! It was different to all the other websites, because the others explain Impressionism quite confusingly! Thank you! it really helped me with my art homework on impressionism. I didn´t know what it was until i read it. uh yh cool i like ur blog its very interesting, i will keep visiting. keep up the good work!!!!!!!!! thats really funny... but surly ur supposed to be doing work if ur @skool how old r u? really helped explaining impressionism for my GCSE landscape project; thanks ! I had to do a 2 page homework on impressionism and this really helped me i also got really high grades on this. so i thank the editor or author of this and i encourage people to use this site for their homework!!!!! Doing an art HW and this helped greatly whoever posted this is extremely thanked! This was great for my homework thanks!!!!!!!!! this helped me sosoosososoosos much thank you!!!!!!!!!!!!!!! thanks, this site was great for helping me understand impressionism for my art essay that im working on. THANKS SO MUCH! My art homework was to pick a type of artwork then do a double page all about it but we had to draw all the pictures! My dad has been nagging me because its been taking so long but you helped me loads! Ill definitively be coming back to this sight again! !